Last month, Ainsley and I decided to take a trip on a whim. Initially, we'd planned to catch the train to Manchester; but quickly we realised it was actually cheaper to go abroad (a recurring theme with the prices on Britain's rail network!) 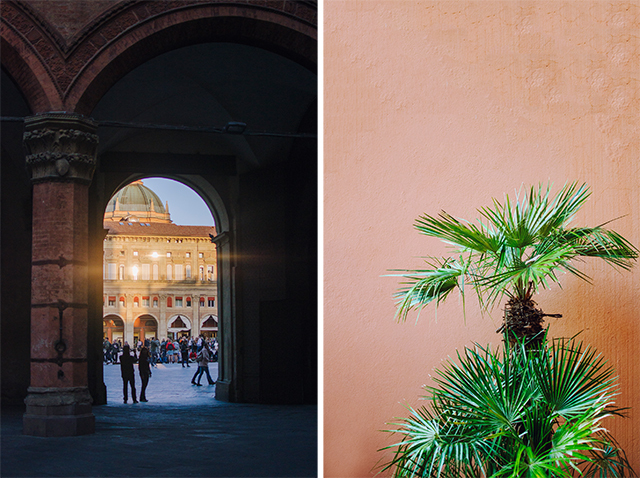 So, we ended up in Bologna. It couldn't have been a more perfect place to spend our thirty hours - the weather was perfect, the food was great, and the city is beautiful. Wandering down from our hostel into the city centre, we couldn't find the Finistrella di via Piella, but we got to see Bologna's 'secret canal' from another street instead (via Guglielmo Oberdan), which was a little easier to get to. Our first real taste of the city's history was the Two Towers (le due Torri), the largest standing towers left of around one hundred which dotted the city during the medieval era, used as watchtowers but also as signifiers of noble families' wealth and power. The Two Towers were built in around the twelfth century, and whilst the Garisenda Tower has been closed off due to its severe tilt, the lesser-leaning but taller Asinelli Tower remains open to climb! We decided to give the few hundred stairs a go, and were rewarded with a perfect panoramic view over the entire city - well worth the €3 entry fee, and the aching legs. The main city square, the Piazza Maggiore, is a beautiful open space to sit and enjoy the sun, and take in the sights: the unfinished but beautiful Basilica di San Petronio, half brick and half pastel facade, and the four impressive palazzos which made this place centre of Bolognese life for centuries. 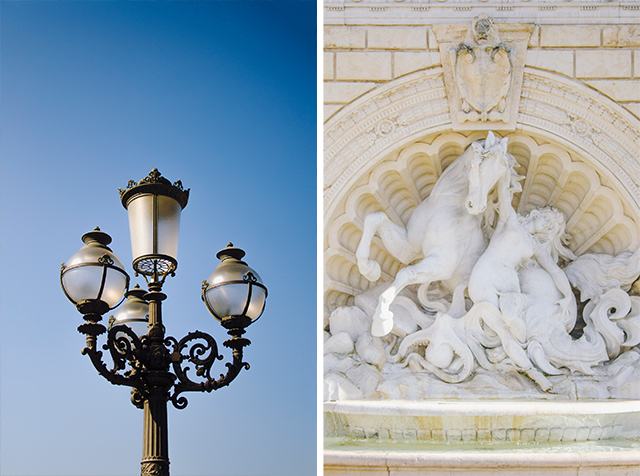 It's also home to the Fontana del Nettuno, which we sadly missed as it's being restored, but is beautiful. 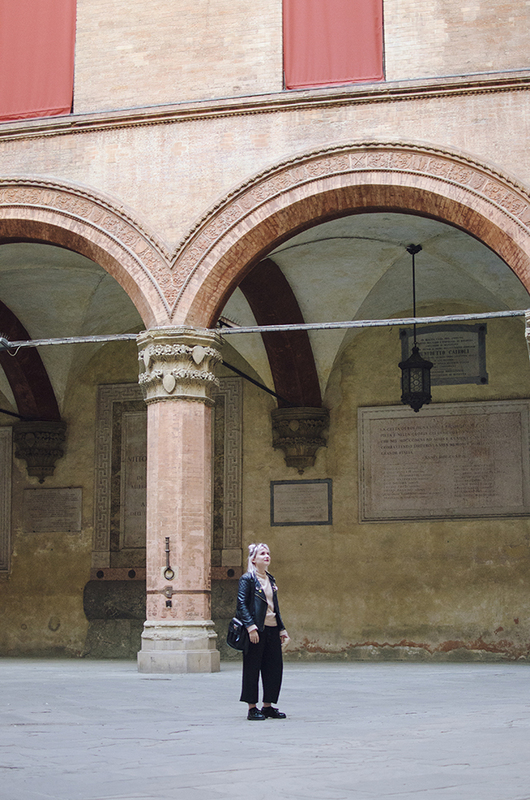 We had a peek inside the quiet courtyard of the Palazzo Communale (home to the city's Civic Art Collection), but we arrived after closing - we'll save the interior for our next visit. On day two we had our bearings - the city is small and easily walkable - so were able to pack in a few more of the sights. 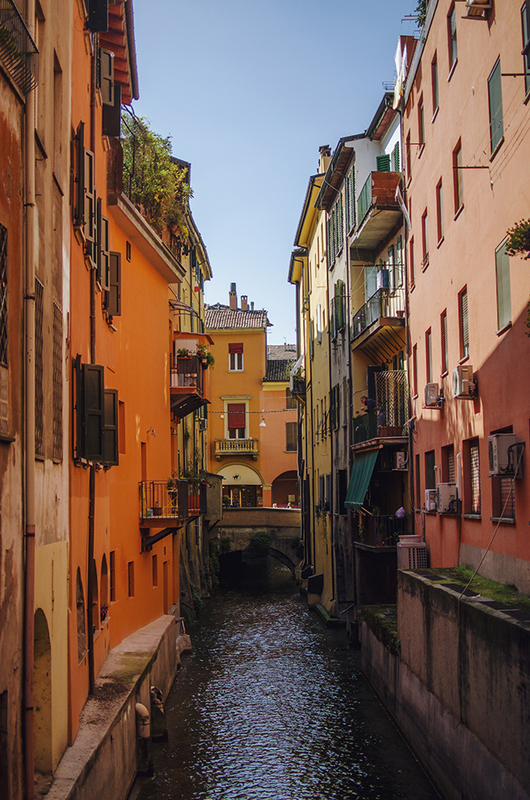 We walked the long way through the smaller streets to pay a second visit to the food markets, stopping by one of the many university museums, the Museo di Zoologia (via Selmi 3) in the university quarter. The museum's holdings are based on the collection of the pioneering sixteenth-century naturalist Ulisse Aldrovandi; the place really retains a 'cabinet of curiosities' feel, including some fairly amusing taxidermy specimens! Our highlights were the two huge, bizarre sunfish which hang in the main gallery and on the staircase. Back in the centre, we went to the gothic Chiesa di Santa Maria dei Servi (Strada Maggiore 43), drawn in by the porticoes outside. 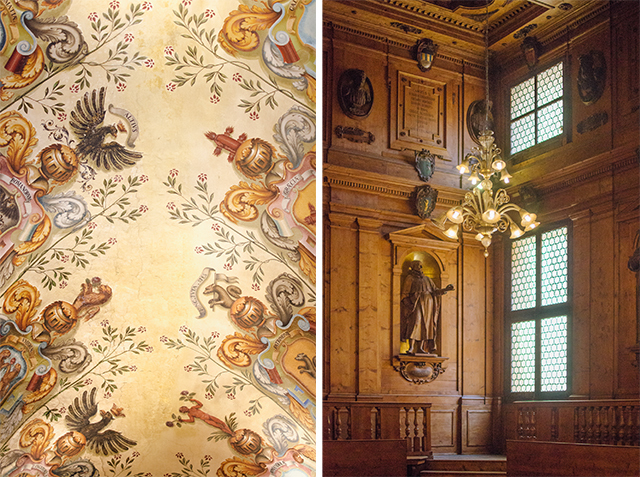 Inside, you can see fourteenth century frescoes and several paintings by Bolognese masters. 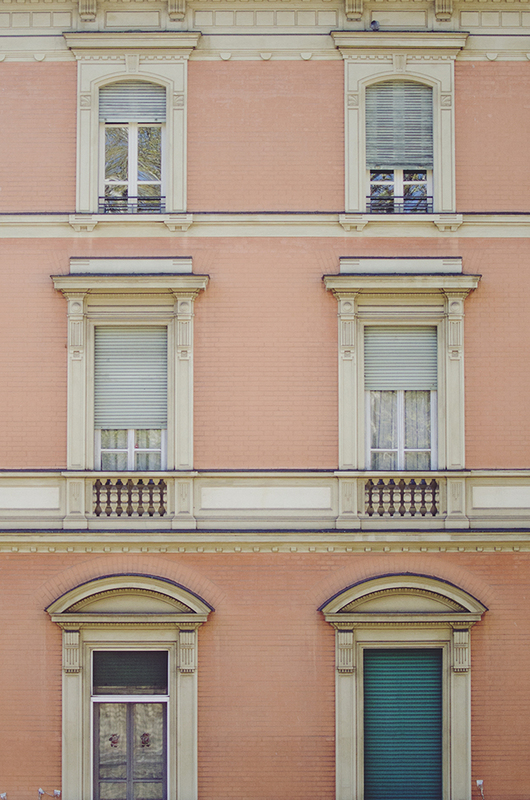 Just opposite is the Palazzo Bargellini (Strada Maggiore 44), housing the Museo Civico d'Arte Industriale e Galleria Davia Bargellini. 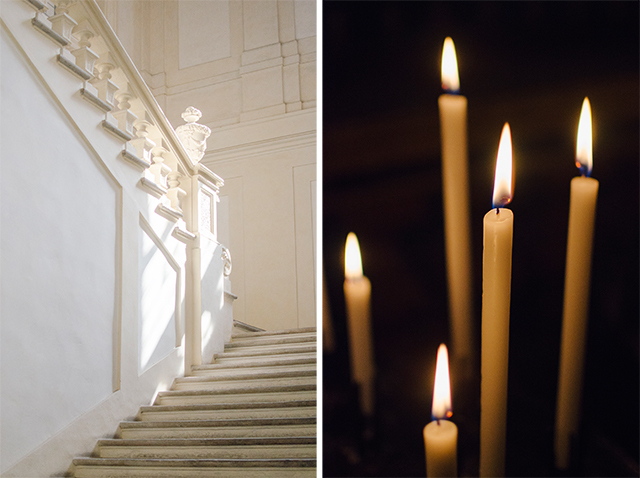 The building features the most incredible white staircase, and the museum holds all kinds of items from elaborate wrought iron keys and ceramics to religious artwork and portraits; there's even a large gilded carriage! 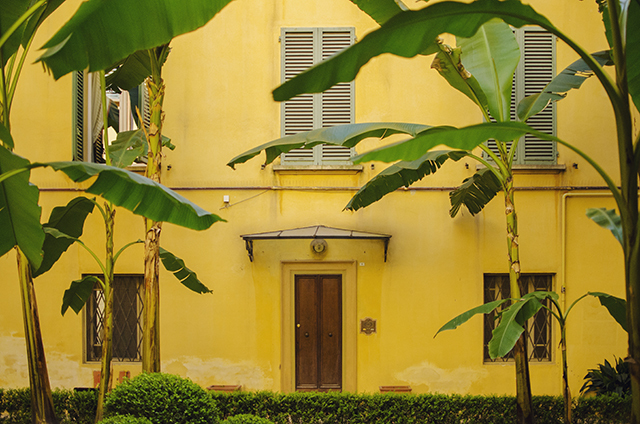 We didn't have time to visit the Museo Internazionale e Biblioteca della Musica (Strada Maggiore 34) just next door, but I had to pop in to take some photographs of the colourful courtyard filled with huge banana plants. 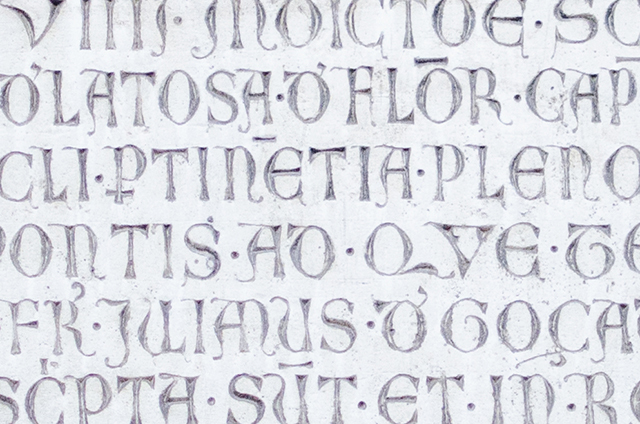 Next on our list was the Complesso di Santo Stefano (via Santo Stefano 24), also known as the Seven Churches. Parts of the complex are thought to be from as early as the fifth century, and it's a beautiful place to spend some time. Our final stop in Bologna was the Archiginnasio (Piazza Galvani 1), the original seat of the University of Bologna, which is the oldest university in the world. The walls of the interiors are painted throughout, creating an enormous network of around six thousand coats of arms dating back as early as the 1500s. The building is home to a library of just under a million volumes, as well as the Teatro Anatomico, a beautiful wood-panelled lecture theatre used for anatomy classes. The ceiling is carved with figures representing the constellations, in the centre stands the marble dissection table and the canopy over the teacher's chair is held by two carved, 'skinned' men. If I had to choose, the Archiginnasio would be at the top of my list to visit in Bologna. 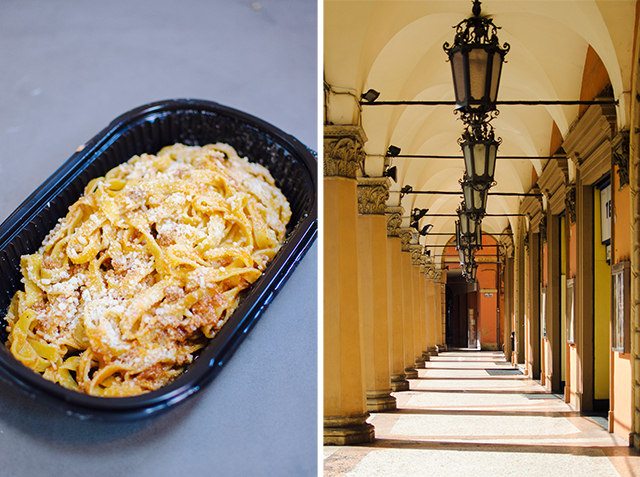 Bologna is known for its food: one of its nicknames is 'la Grassa' for a reason. The Quadrilatero brims with stalls of beautiful fruit and vegetables, handmade pasta and fresh seafood, and little restaurants filled with people enjoying platters of cured meats and cheese. My favourite stop here was La Baita Formaggi (via Pescherie Vecchie 3a), with its giant blocks of cheese and hanging legs of ham, where I stocked up on local parmigiano reggiano and dried pasta to take back home. 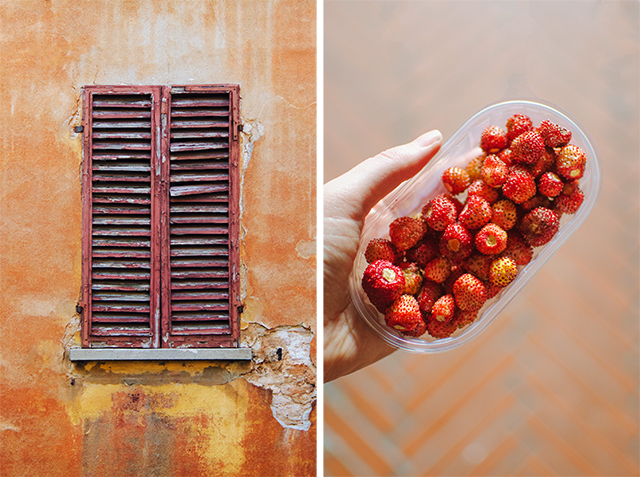 I also picked up a punnet of tiny wild strawberries, which taste incredible - I've never seen them in the UK apart from growing in my childhood home, so I found that pretty exciting! We didn't have a lot of time for sit down meals, so I was thrilled to find tagliatelle ragu to go at the Mercato di Mezzo (via Clavature 12) and tortellini with sage butter at another takeaway. In thirty hours we managed three lots of gelato - twice at Gelatauro, which was so good we couldn't resist going back, and a total bargain at just over €2. 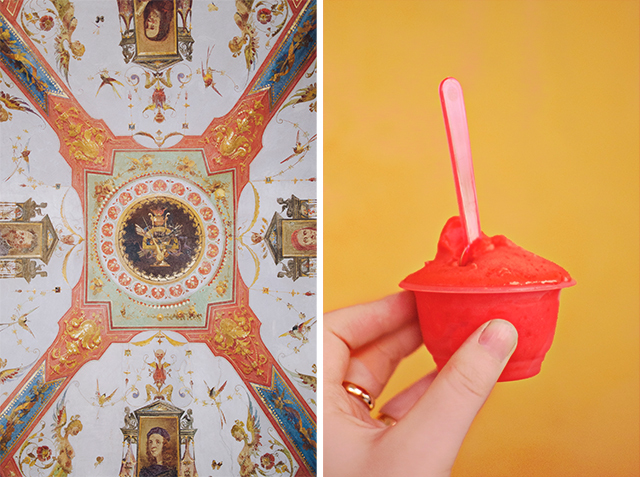 Their strawberry sorbet was the best I've ever tasted (try it with the chocolate hazelnut gelato). Travelling with a vegan, I was a little worried about the availability of food free from animal products in a city known for meat and cheese - but we were spoilt for choice, with a selection of vegan eateries to easily rival London's (and in a much, much smaller city). For dinner we headed to Botanica Lab (via Battibecco 4c), a solely plant-based restaurant which uses seasonal, organic and often gluten-free ingredients. The prices are reasonable, the interiors are beautiful, the staff are lovely, and the food is tasty and creative - it's not often we find somewhere that Ainsley can eat anything on the menu, and I think even the most narrow-minded meat eater could find something satisfying to eat. We also tried out La Margherita (via Nazario Sauro 28b), a little all-vegan bar, for a great seitan burger, and the vegan fast food outlet Universo Vegano (Largo Respighi 6) which I was impressed to find also makes an effort to have zero food miles and eliminate palm oil. In addition, we passed several other tasty-looking options: Cento3Cento Veg (via Centotrecento 12a), serving up seasonal vegan and vegetarian street food; the cafe and juice bar Centrifuga (via Nazario Sauro 23b); and Un'Altra Idea (via Marsala 29b), a vegan restaurant offering pizza and pasta. There's a whole host of other vegan and vegetarian-friendly options, too - Bologna seems to be a foodie city for pretty much everybody. 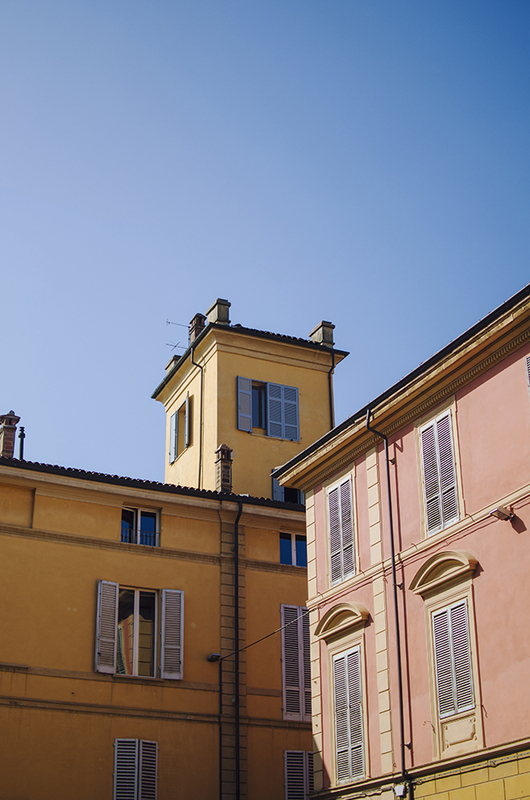 There are plenty of lovely hotels in the city, but we didn't want to spend much on a hotel we'd barely see - luckily, Bologna has great options for budget travellers. We stayed at Dopa Hostel (Via Irnerio, 41), which was only €24 each for a comfortable bed in a six person dorm. Situated in the university district about ten to fifteen minutes walk from the central Piazza Maggiore, it has a beautiful communal kitchen with breakfast included, a lounge with a record player, guitar and books, and decent bathrooms. The dorm beds are built like cubby holes, which give plenty of privacy and come with lockers for valuables. The staff were friendly and eager to advise us about the best bars and trips in the area, and all in all it had a lovely relaxed atmosphere. We booked flights about a month in advance with Ryanair, flying from Stansted for less than £40 return. 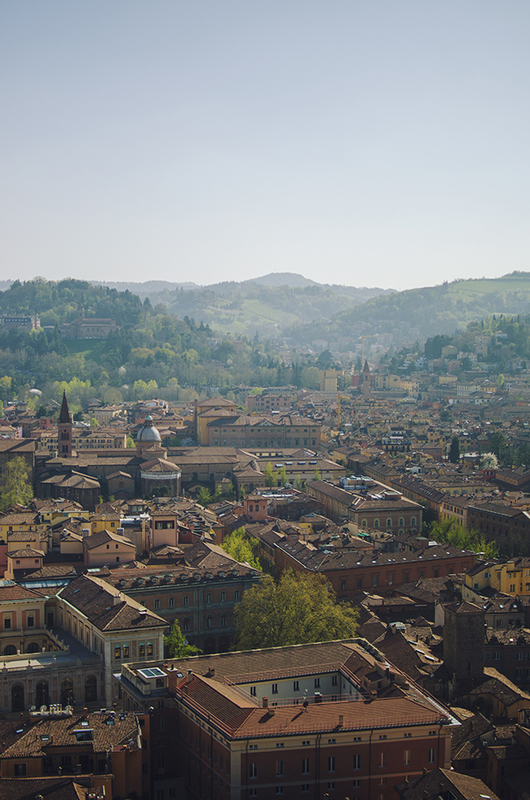 Bologna's airport is only a few kilometres from the city centre, and the €6 Aerobus runs into the city every 15 minutes. Coming into the city centre, it's best to get off at the stop near the Parco della Montagnola; we found that going back to the airport, it was easier to walk ten minutes through this park to Bologna Centrale station rather than work out where we could get on in the city. 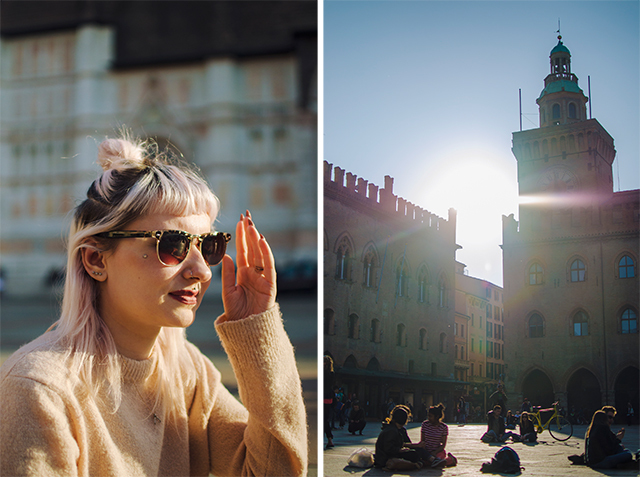 Ah Bologna is on my list of places to visit and now it's moved up even higher! There always seems be such great deals on flights!